There’s been a lot of change in my life the last couple of weeks. 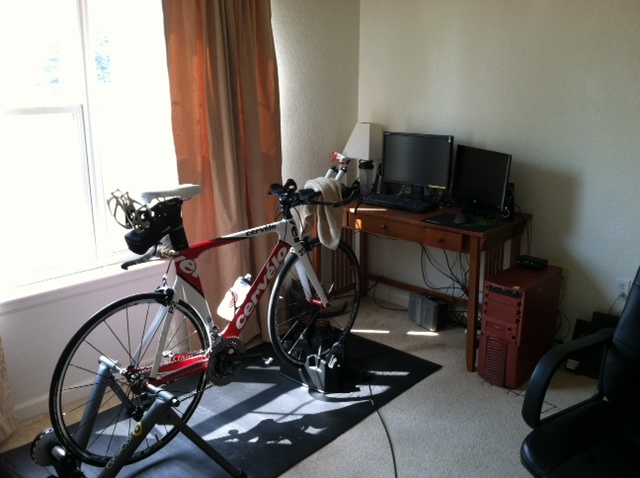 Not only have I converted full-time to triathlon, changed my bike fit and moved to a new apartment. The first order of business has been finding appropriate training routes, which has been difficult given the new suburban area I now live. All is not lost though, this new-found challenge has given me motivation to try something new in my training. Trainer work! It’s recently become in vogue by many professional triathletes to do most of their bike training indoors using short-ish, intense sessions. Given the controllable nature of the trainer (no wind, stop lights, etc), it makes sense that you could get more quality work in this way, but it does provoke boredom. Riding inside isn’t exactly a ton of fun, but over the last few weeks I’ve been honing my trainer workouts as well as modifying my environment to make this much more enjoyable. The secret is to keep the sessions moving. By this, I mean intervals! For me, as long as I can watch the clock for short periods of time, my mind won’t get tired as quickly and I can actually ride inside for considerable amounts of time before getting anxious. I’ve included a few of my workouts below and you’ll notice that they are rather simple. Personally, I think people are making bike training way to complicated. As triathletes, we only really care about three different speeds: 1) Recovery Pace, 2) Endurance Pace (long outdoor rides) and 3) Threshold Pace (bread and butter of your intervals). Yes, you may need to throw in some V02 from time to time, but this really shouldn’t be a major part of you cycling diet. In fact, I bet that if anyone purely focuses on these three zones that you’ll make more progress in six months than with any of the more complicated schemes out there. I’m sure I’ll write-up a complete post on this topic one day as it’s something I’m pretty passionate about. As far as my environment goes, Netflix has been my saving grace. I’ll start-up some standup comedy, TV shows or movies in order to keep myself entertained and, I’m not going to lie, it’s gotten pretty nerdy. I’m currently working my way through Star Trek: Voyager and Star Trek: The Next Generation with the odd comedian now and then for some added flavor. I’ll change-up these workouts from time to time based on the time of year. For example, as races approach, I’ll increase the length of the SST intervals or add bursts to the FTP set. But for the most part this is the skeleton that I follow for all of my indoor work. It’s tough, but yields great results. So, how do you guys handle indoor training? Are there any tricks that you use to keep yourself mentally occupied, got any favorite workouts, comment below!